The US Department of Energy has just released the results of a study indicating no evidence of fracking fluid migration to groundwater aquifers. A US Department of Energy study by its National Technology Energy Laboratory was released yesterday and it’s the good news everyone familiar with the industry and its history expected, but it predictably disappointed a lot of fractivists who are already moaning, groaning and making excuses. The report entitled “An Evaluation of Fracture Growth and Gas/Fluid Migration as Horizontal Marcellus Shale Gas Wells are Hydraulically Fractured in Greene County, Pennsylvania,” is filled with detailed data and superb charts. It speaks for itself, but is somewhat technical. The end result is this; there is no evidence of fracking fluid migration anywhere near water supplies. 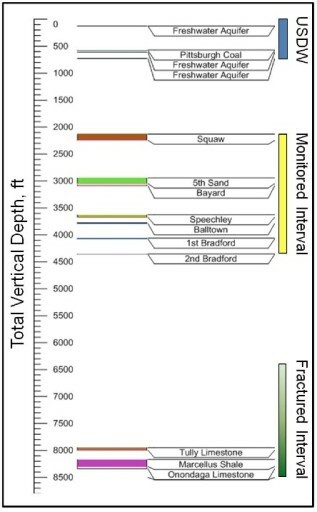 Conclusions of this study are: 1) the impact of hydraulic fracturing on the rock mass did not extend to the Upper Devonian/Lower Mississippian gas field; and 2) there has been no detectable migration of gas or aqueous fluids to the Upper Devonian/Lower Mississippian gas field during the monitored period after hydraulic fracturing. The statements are all from the Executive Summary, but there is more. 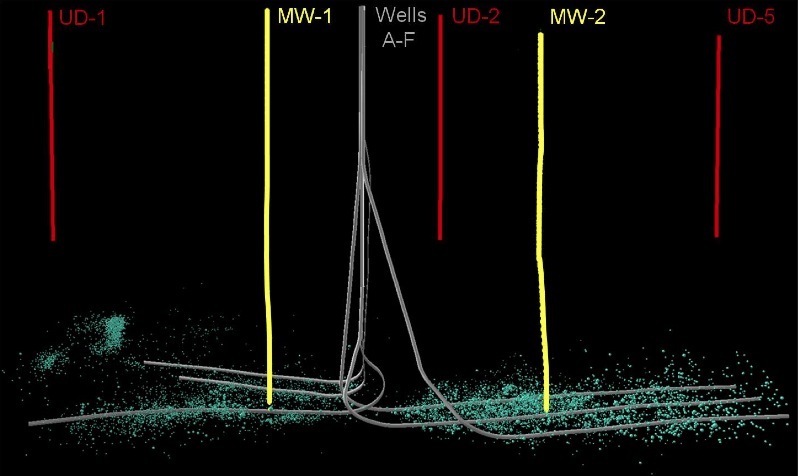 The following chart, for example, displays where fracturing occurred relative to horizontal Marcellus Shale gas wells (A-F), vertical Marcellus Shale gas wells (MW-1 and MW-2), and vertical Upper Devonian/Lower Mississippian gas wells (UD-1, UD-2, and UD- 5). Light blue spheres depict microseismic events located during the hydraulic fracturing of horizontal Marcellus Shale gas wells. There was no communication or opportunity for fracking fluid migration. 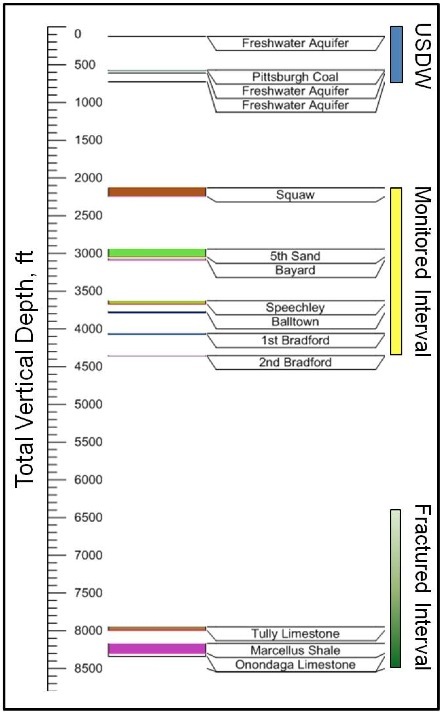 Notice the great distance between the fracturing level and the aquifers. The study demonstrates nothing happened anywhere near the monitoring levels, let alone the levels where the aquifers are located, proving, yet again, what EPA and several states have repeated for years – there is no evidence of fracking fluid migration into water supplies. Getting gas out of shale is done by fracking, requiring an average of 5 million gallons of water for each well — poisoned with an unknown slurry of dangerous chemicals and forced into the earth to fracture the rock that holds the gas…The choice is not drilling and fracking or shivering cold and in the dark – the choice is drilling and fracking with all of its toxic pollution and climate changing devastation or clean energy from the sun, wind and earth that gives us a safe, healthy and bright future for all. “There are a whole wealth of harms associated with shale gas development” separate from fracking, said Maya K. van Rossum of the Delaware Riverkeeper group. She mentioned methane gas leaks, wasteful use of fresh water, and air pollution, and said the DOE study confirms a point that the Riverkeeper has been making: that faulty well construction is the root cause of most problems, not natural geologic migration of chemicals. Maya, like all fractivists, wants it both ways; she wants us to think fracking is dangerous until it’s proven otherwise and then, well, it must be something else, with the predictable lies about having always said that. Fortunately, the evidence is forcing these admissions more often than ever lately. Another study released over the weekend says much the same as this one (report here). Fracking fluid migration to water supplies doesn’t happen. Period. the results of this study does not prove that migration couldn’t happen in other areas ( with different geology .When testing is done in ever area that is drilled and the results are the same then it would be conclusive .Until then it is still something that is not proven in total . Tom, two months of monitoring is but an instant in geological time – wouldn’t you agree? Who would expect these migrations to occur so quickly? When are the long-term and cumulative impacts of these practices going to be studied? As you know, the answer is never. We are in the midst of an industrial-scale experiment to see what happens. Are a few extra years of natural gas really worth the risks to the whole region? Is selling out American Energy, Worth putting a few extra buck in your own pocket? For you, that answer seems to be yes. Study after study over the last 50 years and more intense study during the last 30 years have yet to reveal one case of fracking polluting a water well. In 1961 a gas well was fracked using a nuclear devise 10x the power of the two we dropped on Japan in I believe Colorado. That frack failed for two reasons, it made the gas too radio active to use and it melted the rock making the gas unobtainable. HOWEVER… the EPA and the federal government have been and continue to monitor several water aquifers within a few miles of this well and have not seen any radiation or other effects from the atomic frack to date. look- we all know NO amount of evidence is enough to satisfy radical activists, who are untroubled by their personal pollution and energy consumption. they are on a religious crusade, a holy war that is roughly analogous to Islamic State in Syria and Iraq.